10 Media Trainers participate in collaborative training on production and dissemination of local contents and building capacity of content producers. 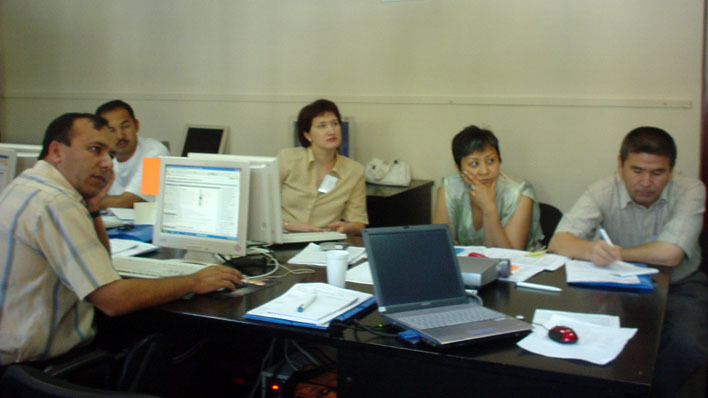 5-8 July 2005, Almaty, Kazakhstan. At the previous time most of trainers was invited from Russia and countries outside of central Asia. It’s a first UNESCO/Internews activity in Central Asia with long-term goal on creation of local pool of media trainers in Central Asian countries, specialized on local content production. Agenda, Roles of Organizers, dates and participants will be clarified on this page. UNESCO's Audiovisual E-Platform offers an alternative communication channel where challenging, creative and innovative productions can be found, fully screened on-line and acquired. The platform, which is officially launched today, consists of recently directed television productions, including documentaries, short fiction films, children's programmes and TV-magazines, that are original in form and content, going beyond conventional forms of television language as well as a genuine expression of different cultures in the world. The system, highly secured and restricted to professional use only, works at two different levels. At an individual level, independent directors, producers and distributors are able to use this tool and promote their work on their own. At an institutional level, UNESCO and its partners are able to stimulate the distribution of the platform's materials with broadcasters, distribution networks, festivals, cultural institutions and other partners. The Audiovisual E-Platform has been created to empower local producers to reach international audiences while enhancing the effectiveness of the Internet as a medium for communication and delivery.